We have often heard “Respect cannot be demanded – it is to be earned” and before one can earn respect from others one has to learn to have self respect. Self respect for your identity, who you are, where you come from, your roots and your heritage. Admittedly to-day’s world is “INSTANTANEOUS” – and in a ‘FAST FORWARD’ mode where you are literally ‘ON LINE’ all the time. So to be successful in this rat race you have to hone your skills continuously in your chosen professional field or business, where the medium of education is English as also the medium of communication, so you just have to be proficient in this language even to survive. Nothing wrong with that. But are you aware that the most widely used language in the world is CHINESE, not ENGLISH. Population apart, the fact remains that no matter where they are – be it in the US, Europe, Hong Kong, UK or wherever – the Chinese will always communicate amongst themselves and at home in their Mother Tongue. They respect their identity and to-day the world respects them and their industrial and economic strength. Leave alone the Chinese even the Italians, Jews, Hispanics etc settled in US and various parts of the world, although educated in English always CAN SPEAK Italian, Hebrew, Spanish etc. and do so amongst themselves. THAT IS WHAT ONE MEANS BY IDENTITY. THE WORLD THEN LEARNS TO RESPECT YOU BECAUSE YOU RESPECT YOURSELF. This “Kya fayda hai” and “what’s the use” syndrome, I have come to the conclusion is not an inherent characteristics or the spontaneous response of the post partition generation but has been subconsciously planted by the immigrant generation. Having lost their roots, it was probably felt that the “mantra” for survival and success was to try to quickly assimilate within the society that gave some semblance of shelter and ape their customs, behaviour and mannerisms. Probably the natural instinct for self preservation led to the subconscious process of distancing oneself and switching off to blank out the trauma experienced. The key to success became identifying with the rich and successful and knowing English was the stepping stone. What pride our parents experienced, when as 5 or 6 year olds we could recite “Twinkle Twinkle Little Star…….” and other such English rhymes in front of visitors. Today I can squarely hold our parents and elders to blame for the lack of interest in Sindhiat amongst the current generation, may be with no malafide intention. But that’s now History. May be the circumstances were such that they felt they had to break with the past and make new beginnings and meaning well for their children at all times, thought more of their materialistic needs and physical comforts and less about the spiritual needs and character development. Offcourse there are exceptions, but this has been the general trend. We find time to read books and magazines, see movies and television programmes on subjects that interest us, to increase our knowledge and for leisure. Is not the knowledge about our identity, culture and history, one of the most interesting subjects to familiarise ourselves with and simultaneously an enriching form of leisure? 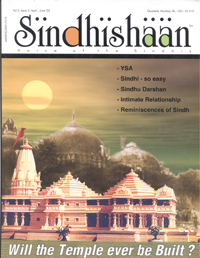 WHAT USE IS SINDHI? HOW WILL IT HELP US? It’s time to change this attitude and take a 180° U-turn and start building up our Self-Esteem and Self-Respect. We are part of the most ancient and highly developed civilization on this planet, so let no one mess around with us. WE ARE SINDHIS. Try this attitude and see how others start looking up to you.